President Trump signed the sweeping $1.5 trillion tax cut bill minutes before he departed the White House for Mar-a-Lago Friday morning. "We're very proud of it," Mr. Trump said of the measure, adding that it contains "tremendous things" for businesses, for workers, for the middle class and for job creation. Mr. Trump told reporters in the Oval Office he had planned to wait for a formal signing event in January, but when he saw the news reports pointing out that he had said he'd sign by Christmas, he said he "immediately" called and said to get the bill ready to sign. He praised the measure for lowering corporate tax rates, which he said would mean more things would be made in the U.S. And he also singled out the "one-year" expensing provision in the bill. Companies, he said, would go "wild" about this. Under this provision, known as full expensing, companies can immediately write off the full cost of equipment they buy. The owner of the New England Patriots, Bob Kraft, according to the president, called him to praise the bill, and also said he would buy a factory in North Carolina to open a new paper plant. Mr. Trump also signed the continuing resolution to fund government spending into the new year. 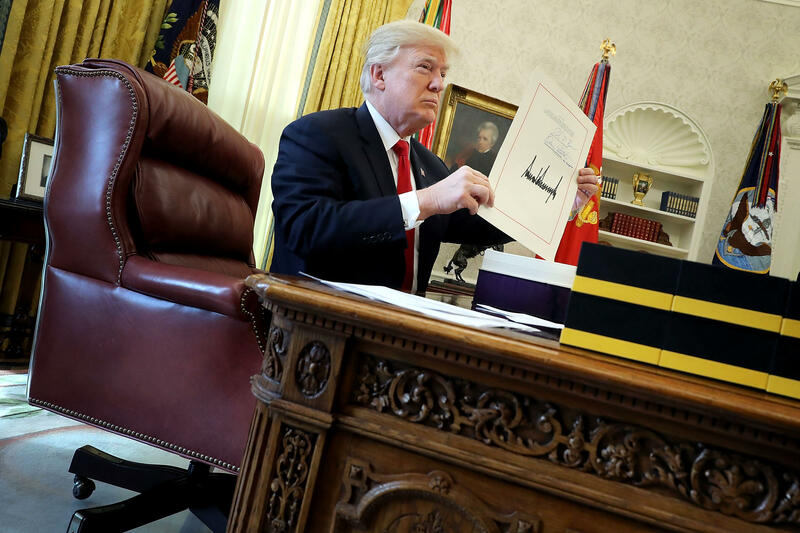 He also signed off on $4 billion for missile defense spending and put his signature on a related letter to GOP congressional leaders House Speaker Paul Ryan, R-Wisconsin, and Senate Majority Leader Mitch McConnell. He claimed the measure was bigger than the tax cut legislation passed three decades ago under Ronald Reagan. Mr. Trump also thanked a list of people for passage of the bill, including McConnell, Ryan, Sens. Rob Portman and Tim Scott, House Ways and Means Chairman, and Kevin Brady. Since none of those lawmakers was present for the signing, the president offered the signing pens to members of the press, especially the cameramen. Mr. Trump predicted that Democrats would regret not supporting the GOP tax plan, but he predicted that there would be some bipartisan work possible in the months ahead. In particular, he singled out infrastructure, saying that "infrastructure is by far the easiest." He went on to say, "I could have started with infrastructure. I wanted to save the easy one for the one down the road." CBS News Chief White House correspondent Major Garrett points out that everything the president has achieved so far legislatively involves special rules that allowed the Senate to rely on a simple majority, rather than the higher threshold of 60 votes that is usually the rule. The rollback of Obama-era regulations, this tax bill, the Supreme Court nomination of Neil Gorsuch have all been passed with only Republican votes. Everything else the president wants to do -- raising military spending, repairing the nation's infrastructure, extending the children's health insurance program, addressing the plight of DACA recipients -- all of those can only be achieved with Democratic votes in the Senate, Garrett points out. All of them require genuine bipartisan compromise, a path the president has not taken so far. There are some, Garrett also said, who regret that the president didn't choose to push infrastructure spending first, suggesting that if he had started with infrastructure, it would have attracted Democratic votes and paved the way for more bipartisan legislation. Now, in an election year, with legislation passed that is entirely Republican, this could be more challenging. "Will be signing the biggest ever Tax Cut and Reform Bill in 30 minutes in Oval Office," Mr. Trump tweeted earlier Friday. "Will also be signing a much needed 4 billion dollar missile defense bill." Garrett initially reported that the signing would be private, but at the last minute, the White House allowed pool reporters into the Oval Office to cover the signing. The president, having explained why he had originally planned to sign the bill after the new year, said of the impromptu signing event, "It's not fancy, but it's the Oval Office." The White House plans an event to celebrate the signing early in the new year, in about two weeks, the president said. The timing of the president's signing of the bill had been uncertain until Congress passed a short-term spending bill that suspended the "pay-go" rule, which demands that measures like the tax cut legislation be paid for with automatic spending cuts to offset the cost. The $1.5 trillion tax measure would have required an average $150 billion in cuts over the next decade if the pay-go rule had not been waived. Earlier this week, Congress passed the tax bill, which permanently slashes corporate tax rates, and also cuts individual tax rates. Most Americans will get a tax cut, but not all. How households will fare varies widely. Families earning the same dollar amounts can pay vastly different income tax rates, depending on the particulars of their family and where their income comes from.